Tomorrow he'll be three weeks. For a long time I haven't wanted to write anything here; I haven't wanted to share my life with anyone because I wanted to protect the things I was going through in my pregnancy. And now so much has gone on in our lives that I don't have a clue where to begin. These nearly three weeks have been filled with happy and sad tears, lots of reflection, loss, new life, renewed hope and endless kindness. Labels: baby boy, birth, sons. Whenever I have a spare moment I find myself going through baby photos of Roman. Such as the above. You see I'm panicking about having a baby again because I'm worried about all the things I know about. I could write a book about lack of sleep, that pain after childbirth (you hurt in places you didn't know you had), breastfeeding going wrong, then right, then wrong and then finally settling into a great pattern and suddenly ending before you're ready to give it up and your child self-weans. On top of the anxiety and panic there are the things I've forgotten; the immense love that comes from seemingly nowhere that makes that pain after childbirth totally worth it. And there are the things I know; lack of sleep exists but eventually, piece by piece, you get your sleep back. But then I tell myself; when will I sleep?! Roman doesn't nap, so I can't 'sleep when the baby sleeps' - a common tip new mothers are told over here. Also as I'm housebound right now (more pregnancy complications) I'm worried about being housebound when the baby comes. When Roman was a baby there were stretches of months when I was in bed - I had forgotten what my living room looked like. When I eventually did get out (when my parents visited) my eyes felt like they were being burned by the sun and my skin felt on fire. I'm scared of being stuck indoors with two children, no sleep and in agony (I was in agony for months after Roman was born.) So yes, I'm excited and I'm looking forward to this but I'm also absolutely terrified whenever I let myself think about it. One baby was extremely hard but to juggle one baby and one toddler is going to really, really stretch me physically. I'm not scared of 'losing' my identity or anything like that I'm just scared of making it through the day to day, on my own. People can help here or there but I need more - and I feel selfish and guilty for feeling that - and I can't get more. We're going to need to have this. I'm going to need to have this down. 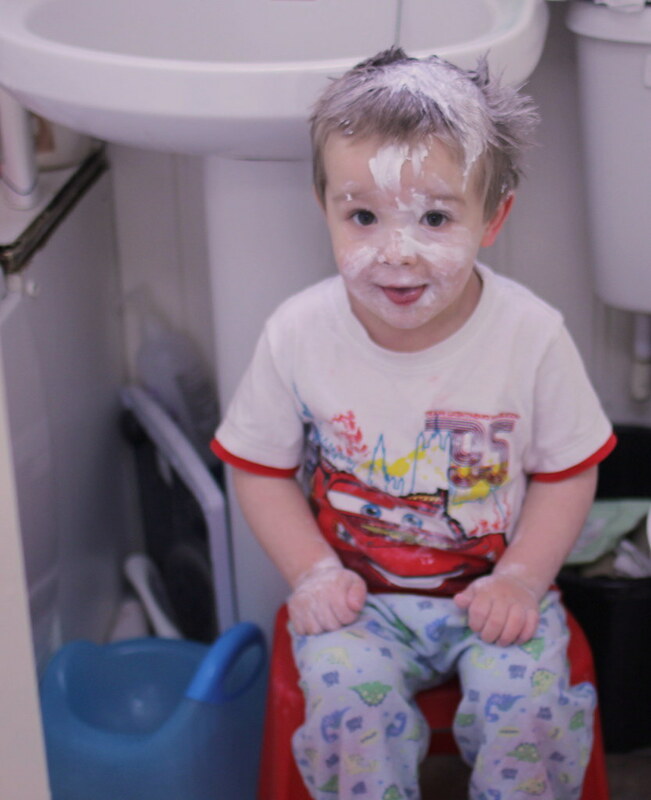 Confessions of a Toilet Training Parent: Part One. Roman is three and only a few short weeks ago he was still in nappies during the day and night. I felt like I'd failed him and myself. When he was old enough to sleep a little longer and give me a little more time to think thoughts that didn't revolve around, 'when I will sleep again?!' and 'I can't stand this feeding every 40 minutes thing! ', I began to think about when that magic age would be to get him out of nappies. So when he was 7 months, I bought a potty. We caught some pee in it, much to his and my delight, and every night before his bath he'd pee on it if cued. But that's the problem; if cued. Not because I felt he was ready both emotionally and physically. And you know, if you want to try potty training a 7 month old then go for it, but I didn't find it doable or realistic to our schedule or lifestyle at that time. So I kept the potty because I knew we'd hit the magic age one day. But when exactly would that magic age come? I wasn't really sure so I'd try every few months to get him interested in using the potty. Sometimes he'd really want to try and show a great interest in it, other times he'd put it on his head and claim it as his hat. Around the 18 month mark he started to show an interest in the toilet again and out came the potty...well instead of going for a pee in his potty he would use his Bumbo seat. My mum then bought him a turtle toilet seat that he loved the look of but freaked out when placed on. After that I gave up and decided we'd really go at potty training after his 2nd birthday. Well he turned 2 and in March I bought him lots and lots of dinosaur pants. He just didn't seem to get the fact that he wasn't supposed to pee in these despite me putting him in them all day, giving him plenty to drink, rewarding him (worst idea ever for a 2 year old), taking him to the toilet and offering up plenty of reminders. I honestly felt like it was never going to happen but then something funny or endearing would happen and it kept me going. One of my best memories of trying to potty train a 2 year old was one Saturday morning, when I was having a lie-in, and Bryan was in charge. I was woken up with a little voice shouting, "Quick, quick, quick, quick!" and little foot steps running to the bathroom to try and make it to the toilet on time. But that one time was a rare occasion and for the majority of the time it was me cleaning up pee off our carpet. In my mind I just knew it wasn't the right timing so by the end of April I gave up pushing the issue and waited for Roman to ask for pants which he never did. 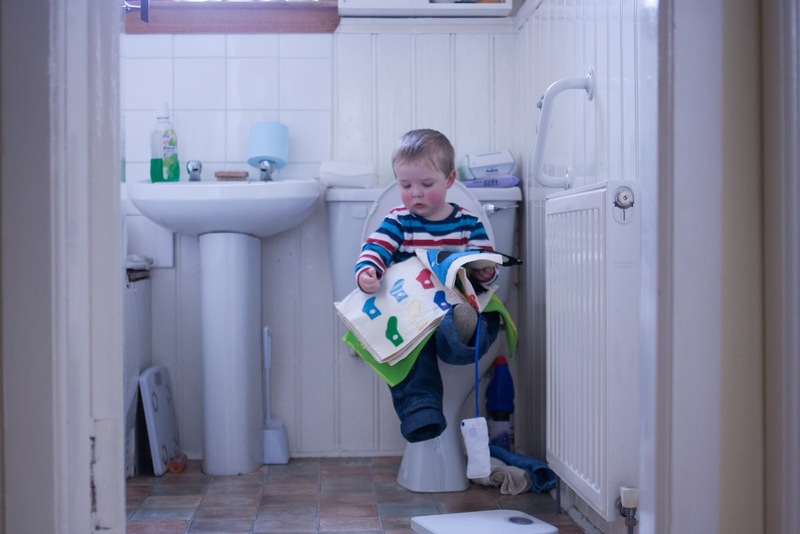 Throughout 2012 we made various attempts at potty training, most of which seemed to work at first but then failed miserably. Trust me when I say I was desperate to get Roman out of nappies but I was also not too keen on forcing the potty or toilet onto him. I was also riddled with first time parental guilt for keeping him in nappies. Most of the blogs I read were stories of 2 year olds fully potty trained and walking around dry in public...I honestly began to question if something was physically wrong with Roman. He would seriously not stop peeing and there were times when he'd make successful trips to the potty all morning and then pee on the floor all afternoon. I was frustrated, full of guilt and stuck on what to do and who to turn to. When my mum was around in August I spent an afternoon quizzing her about it. As expected all four of us were toilet trained either at 2 years or before and after this age. "Are you joking?" I asked, totally defeated. My mum told me that although we were using the toilet there were always accidents. I mean I remember being 4 years old, at school, too scared to ask to use the toilet and being so full to bursting that my bladder would empty - embarrassing, yes, but I was shy and didn't find my voice in school until I was a little older rather than not having bladder control. I honestly felt like crying, giving up and letting my guilt eat me from the inside. This isn't how I expected this to be. "I don't think Roman is ready to use the toilet full time," my mum told me and it was these words, although they'd been said by Bryan many times before, that really took me out of my weird guilt ridden state. Although I didn't want to admit this truth, I knew she was right. I just hadn't allowed myself to see it because I'd been so fixated on that 'magic age' crap and I'd compared myself, and Roman, to other parents and their peeing-in-the-toilet-toddlers. "When he's ready, he'll let you know and there will be no stopping him," my mum said to me, very gently. Huge weight off my shoulders and huge sigh of relief. And sometimes when you get a point of view from the outside looking in it really helps. I can't say my guilt or comparing went away, because it didn't. There were times I just felt ashamed of Roman being 2 years old and still in nappies and there were more times than I care to admit that I compared myself to others. Then something magical happened; whenever there were blog posts about toddlers learning to use the toilet, I didn't read them. Whenever well meaning parents would humble brag about their peeing babies or toddlers I would silently, and gently, tell myself; it's okay, you're not them. And Roman isn't that child. He's your child and he'll do this in his own time, when he's ready and he'll let us know when that time comes. I stopped giving a crap - excuse the pun ;) - and got on with being a parent to my child. Because, really, that's what matters. Making sure you and your child are happy and doing what is right for you. Things like potty/toilet training will happen when they happen but it shouldn't sap the life out of you or consume your thoughts. I began to relax about everything after speaking to my mum because she was someone I could trust not to say something awful, crappy or disrespectful and she pointed out something that I was too scared to admit. Roman wasn't ready, he really wasn't. 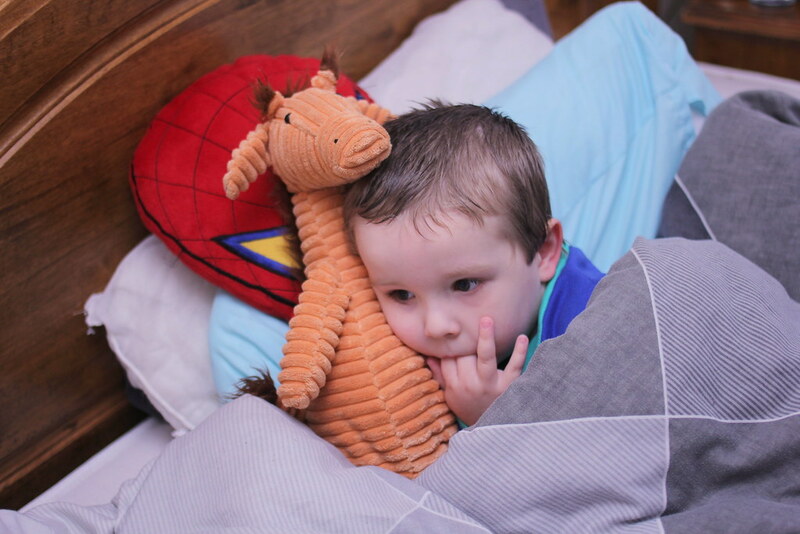 I didn't use to believe in 'readiness' for toilet training and to a point I'm not sure where I stand on that issue today but clearly your child needs to be emotionally set up and prepared for moving out of nappies and then match that emotional readiness to physical control and readiness. Roman didn't crawl until he was almost 11 months, didn't pull himself up to stand until the same age, didn't walk until he was 18 months and for all of those things I can tell you this: he is an observer. He likes to watch how things are done and then practice them once or twice until his technique is where he wants it to be. When he began walking he moved like an unsteady baby zombie for a few days until one day he was steady, sure and completely confident. All through these stages I have been paranoid, worried and full of guilt. Constantly believing I was doing something 'wrong' or that something was physically wrong with Roman - which is easy to think when you're physically messed up. The 'problem' that isn't really a problem is that Roman is a person who likes to do things on his own terms and at his own pace without rules or restrictions around that. I like to think I haven't put any barriers or anxieties around his physical growth, even though I've been riddled with worry and guilt I've always tried to not put that on him. The only 'problem' was me and my worrying ways. 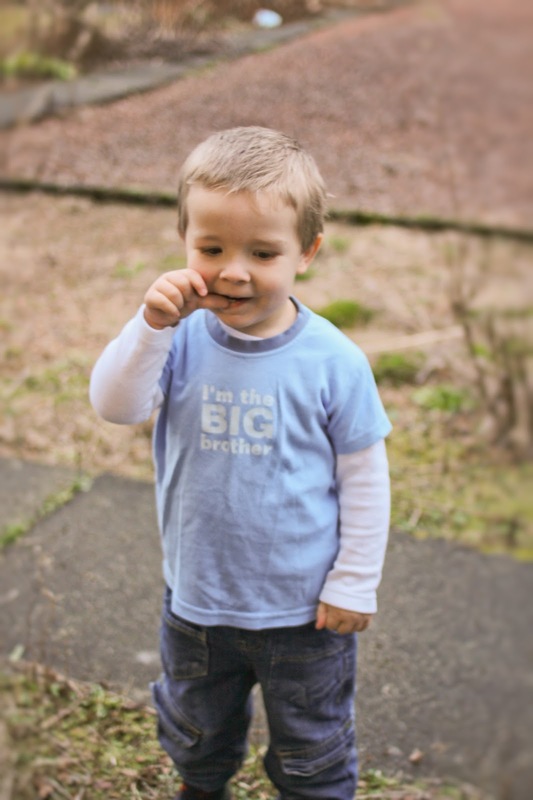 Roman will become a big brother in August of this year. I didn't expect I'd ever have a baby at that time of year. 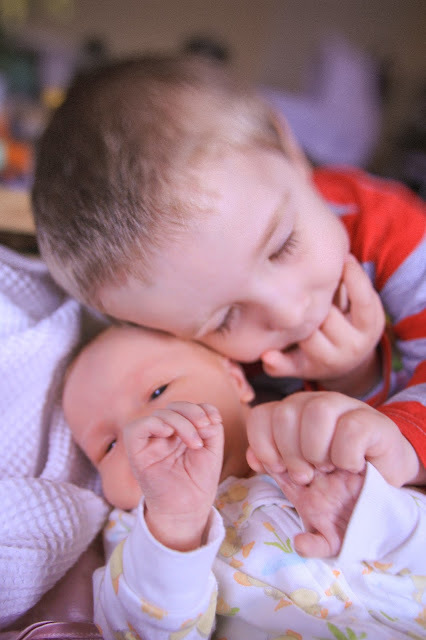 Nor did I expect to be raising two boys together - before I was married I actually had a dream about having a boy and a girl ;). I also never in my wildest dreams imagined I'd have one child, let alone two. I honestly thought Roman would be my only baby, toddler and child. With this in mind I decided to put up my hopes of having another child and it happened - not 'just like that' but it did happen and I am so excited. I've been suffering from a very rare condition called Hyperemesis which has completely floored me this time around. I'm not sure if I'm going to share too much about it, but I'd like to. I find blogging is a big drain on my energy right now so I can't say it will be any time soon. With that aside; here's to the future of Roman's big brotherhood and to two boys! I spotted this funny e-card on Facebook ages ago and it tickled me pink. 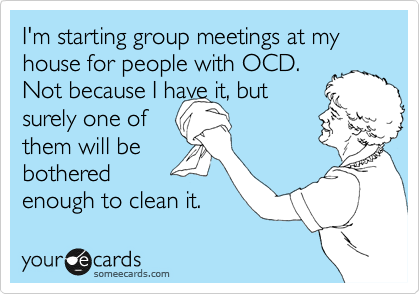 Oh OCD if only you were the cliché everyone believed you were ;). Also...I wrote a post about OCD months ago and I don't really want to share it. I then wrote a post about home schooling and I don't want to share that, either. I also have a bunch of photographs and stories to go with them but I don't want to share those, either. I'm just not sure what's okay or not to share on the Internet these days and quite frankly I don't want someone reading this blog, my Facebook or any other sites I use and feeling like they have some juicy gossip on me or those in my family. I feel myself closing up and closing in on myself, becoming more private than I've been in a long time. I just don't want to share a thing about my life; the good, the bad and the private. I'm not really sure where this leaves my blog. It's a teeny tiny blog anyway and that's how I like it. If I never write another post again then I'm not sure it would matter or have a huge effect on the world - I don't write to effect changes in the world and it's not my job to be held up as an example of modern day motherhood or how people should live their lives but I enjoy the writing, I enjoy telling stories from my point of view and I used to enjoy sharing, too. These days? Not so much. So how does one own a blog, keep writing, but also remain fenced off in areas they'd like to remain private? I'm trying to work that out. I'm also trying to work out if all these thoughts are due to hormonal changes in my body - big, strange and new changes I haven't gone through before - or if I'm simply growing up and realising that sharing isn't always caring. This year I made one New Year's Resolution I was sure I could keep: be kind. Think kind thoughts, do kind things, say kind things and look for kindness in others. It's been hard because I'm sarcastic and get by on the cheeky things I say. And shamefacedly I've often forgot about my resolution. My one resolution. I toyed with losing weight (and funnily enough I've lost a fair amount with being ill) or making more effort to look good - or at least get dressed every day...but those things? While they're 'important' in the scheme of my health and my mental health I figured that being kind was of greater importance. I don't feel good about the world when I spend time (wasted time) thinking unkind things about people. I feel very disconnected to myself, in fact. In high school I was one of these people who would bat away most of the hurtful conversations people would try to have in our little group. "I don't think they're like that!" I would protest with my 'friends' who were talking down other 'friends.' I hated bullying of any kind and ended up in a lot of trouble defending people who were being bullied. I didn't always handle it so brilliantly. One time I saw one of my friends being kicked so I threatened the boy who was kicking her. He laughed in my face and asked what I was going to do about it. "I'm going to beat you up after school!" I declared quite loudly and proudly. After school came and he was waiting for me. Rather than walk past, forget my promise of what I was going to do even though I knew it was wrong, I stood face to face with this boy. This boy that I'd shared a desk with the previous year, this boy that I quite liked (as a friend) and thought was a decent enough person. I threw the first punch which sent him down to the ground. Everyone was cheering me on. I felt sick, I felt like this whole thing was all wrong and I didn't feel like a very nice person in that moment. I don't know what happened next but my friend from the year up came out and suddenly it felt like the whole school was involved in the fight. It snowballed into something I hadn't imagined, all because I'd forgotten to be nice. After the event I got into a lot of trouble. My parents were thoroughly mortified and ashamed of me. I felt so terrible for such a long time, I didn't know how to make it okay with this boy and I didn't know how to take back anything I'd done. But I did learn that being nice is far more important than anything, even if you lose face - whatever that means. I learned that you can be the healthiest, fittest person alive but if you're not a nice person? It doesn't actually matter. You can have supermodel looks but if you're a nasty person then it doesn't matter. You can have well dressed, well mannered children but if you're not a nice parent then none of that matters. If you're not the nice example your children need and deserve then you're doing something wrong. And everything else will fall into place but being nice is my priority for 2013. Have you managed to break or make any resolutions? One of those days where I want to draw a veil over the whole day and be done with it. One of those days where I think to myself; "What am I doing?! I must be mad to sign up to be a parent. I can't wait until he's 15 and out of the house on a Saturday." One of those days where I have to laugh, incident after incident, because otherwise I will lose the plot. One of those days where I have to remind myself; this is what I am given time for. One of those days I will desperately want back when he's 15, out of the house on a Saturday, away with friends and away from my side. One of those days where it didn't take long to fix the problem and it didn't take long for him to avoid a nap and get himself wound up in more cheekiness. Can't Fathers be home-makers, too? A Few Of my Favourite Things: Graze.com. Pee Pee in the Potty!